Many – although not all – roads lead to Jay Douglas Hayes. This character is, of course, Star Trek: Enterprise canon. He is a Major in the MACOs and loses his life during the ENT Countdown episode. In canon, he only has a first initial, and not even a middle initial. I have gone with Jay (a suggestion by the actor who played him) and Douglas in order to dovetail with Doug Beckett. Hence, Jay Douglas Hayes. The main origination point for me was that I enjoyed the character very much, and wish he had been shown more. A rather earthy dream about him was the basis and initial kernel of an idea for Reversal, a story where he is referred to, and is seen in this photograph. However, by the time of Reversal (2157), Jay is already long dead. 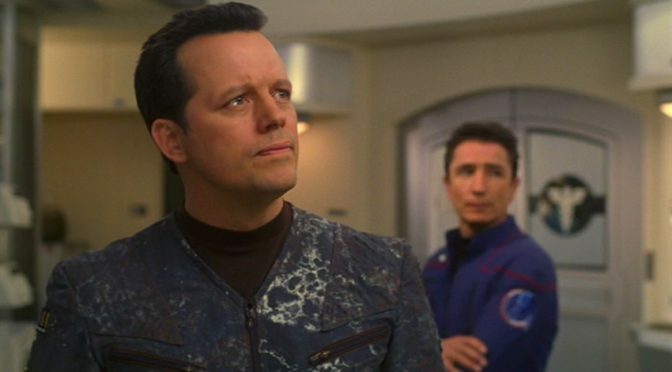 As in canon, Jay is portrayed by veteran actor Steven Culp. Culp has said about the character that he is essentially a David Mamet character, in that he is more action than talk much of the time. In canon, he rarely smiles. In fact, I think one of the few times he even comes close to smiling is in this image. All business, Jay is surprised and genuinely hurt that Malcolm Reed would think that he was attempting to undermine the Tactical Officer’s authority. For Jay, it’s about getting the job done. However, he does so with few niceties. For Malcolm, this is unacceptable, and there is a need for communications and for protocols to be followed. In canon, Jay eventually admits that blindly following the chain of command isn’t as easy as it may seem, nor is it always the right thing to do. For him, the excuse of “I was only following orders” could have rung true, until that moment. In the E2 stories I am currently writing, Jay is in a state of melancholy, but so are many of the other people, as clinical depression runs rampant, at least at the beginning of those stories. For Jay, it takes the form of regrets about an old relationship with a woman he identifies as his most important ex-girlfriend, Susan Cheshire, and he even writes her a letter that he knows she will never read. But Jay is also unexpectedly kind, such as when he carves a walking stick for an injured crewman but doesn’t make it public knowledge. His conflict with Malcolm is shown in any number of stories. In Harvest and in Protocols, which both take place during the Xindi war, he and Malcolm bicker a bit. It’s pretty much just about their ideas about dealing with the Xindi threat. It isn’t until the E2 stories that their arguments become about something else entirely, their rivalry over a woman. In canon, he has no known relationships. I follow on that and, in Together, when Lili and Doug meet with his sister, the attorney Laura Hayes, she confides that he had no one, not even a girlfriend and was “not the marrying kind”. In my fanfiction, he has three important earlier relationships which eventually lead up to his great love, in the E2 stories. The first of these is with Darareaksmey Preap, a Cambodian bar girl that he knew when he was young and in Basic Training, near Phnom Penh. Much like Doug, he lies to Darareaksmey and tells her he loves her, and buys her gifts, in order to be able to lose his virginity to her. The second is Christine Chalmers, possibly known during an assignment. He considers telling her that he loves her until he learns that she’s been cheating on him. The third is the aforementioned Susan Cheshire, who tells him she loves him nearly constantly. But he can’t bring himself to say it in return, and he doesn’t quite understand why until later. In the E2 stories, he learns to let go of Susan’s memory and embrace the woman who will be his great love, the woman he calls Sparrow. This is evoked in Equinox as well when, even after his death, he communicates with her and accidentally calls her Sparrow. Jay Douglas Hayes doesn’t have official theme music, but the Beatles’ Blue Jay Way works rather nicely. Jay’s Mirror Universe counterpart is Doug Beckett. Any discussion of Jay/Doug in the Mirror can be found in that post. Beyond being, perhaps, a bit of a jarhead, Jay Douglas Hayes has a heart and a soul. You just need to be quiet and listen for them.